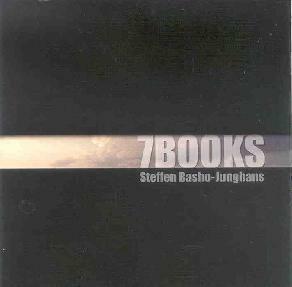 Steffen Basho-Junghans - "7 Books"
After exploring the roots of contemporary acoustic based instrumental music with last year’s fantastic Rivers and Bridges, Basho-Junghans comes roaring back with a 7 song, 2 hour (!) double disc set of some of the most exploratory guitar music this side of Derek Bailey, maybe Bailey if he tried to adopt the approach of minimalist composers? Rod Poole, an acoustic guiarist who uses the “just intonation” scale, also comes to mind. I think the average John Fahey/Robbie Basho fan might find this a bit too alien, in fact even the previous “out” music of Inside and Waters In Azure will not be much preparation for this sprawling set, where “accidents” and utterly non-traditional styles of play are turned into 10-20 minute epics of raging technique and heart. On the second disc he even ups the ante by switching to slide guitar. This man needs to tour, or at least put out a video or something, so we can see how he does this stuff, because as I listen to it it’s really hard to imagine what the heck he is doing to get some of these noises. This release probably isn’t the ideal place for the uninitiated, but hey, I could be wrong, sometimes jumping straight in to the most challenging stuff is the most rewarding, even if it takes a while to come around to. Another stunner from a guy who has already made several. For more information, visit the Strange Attractors web site at: http://www.strange-attractors.com. Or visit the artist at his own web site: http://www.bluemomentarts.de.